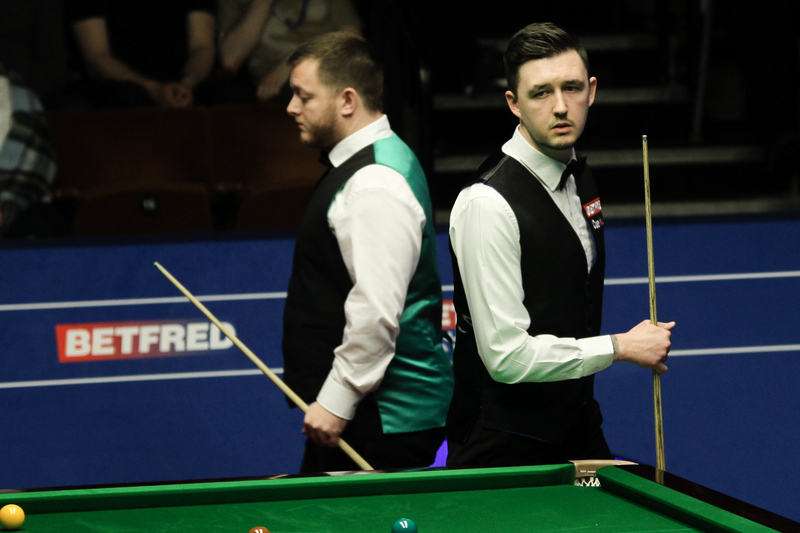 Kyren Wilson continued his brilliant run at the Betfred World Championship by beating Mark Allen 13-9 to reach the quarter-finals. When he won his first ranking title at the Shanghai Masters last September, Wilson established himself as an emerging young talent. And on snooker’s biggest stage the 24-year-old from Kettering has shown that was no flash in the pan. Having won three matches to qualify for the Crucible, Wilson has knocked out Joe Perry and Allen, showing tremendous potting skills and impressive maturity. World number 19 Wilson had only previously played one match at the Crucible, losing in the first round to Ricky Walden two years ago, but he’s now through to the last eight for an intriguing clash with world number one Mark Selby. Wilson did most of the damage in the first session when he went 7-0 up, and he led 11-5 going into today’s conclusion. Seventh seed Allen, who looked on top of his game when he won the Players Championship last month, stormed back to win the first four frames today with top breaks of 86, 103 and 64, closing to 11-9 at the interval. But Wilson weathered the storm and dominated a scrappy 21st frame, then made a break of 71 in the next which proved enough to seal victory. “I am thrilled to get over the line,” said Wilson. “It’s probably one of the strangest matches I’ve ever been involved in, the way that he was dominating for a few frames and then I won a few in a row. It was a crazy. “Something I’ve learned over the last few years is to make sure I fall back into a routine, and my coach here has got me right at the intervals thankfully. “I think I can win it without a doubt. There’s only eight players left in the tournament, and any one of those eight can still win it. “I was here to win it from the start, and I’m here to win it now. Obviously I’ve given myself a better chance now with only three games left, but it doesn’t get any easier. “I’d describe myself as a battler, I can flow when I want to, and when I’m scoring heavily I’ve shown that I can reel off frame after frame. But sometimes that’s not good enough and you have to have another game to fall back on. Northern Ireland’s Allen said: “When I got to 7-5 and also got to 11-9 I put him under a bit of pressure. I thought he might start missing long ones, but it didn’t happen. “In the first session Kyren completely out played me. He’s thoroughly deserved the 7-1 lead, played superb snooker and he didn’t put a foot wrong in the session. I was trying to get under his skin out there but it wasn’t working. “I’ve always been a fighter out there. I try to pass on a few words of wisdom to my stepson Robbie when he plays snooker. I always say to him when he is getting beat, can you win the next frame? And you can, that is all you can do out there is win the next frame. “Kyren is in a good place. His long potting is probably the best I have ever seen, maybe borderline on being very risky. On his bad days they aren’t going to go in and he is going to look a little bit stupid. He’s going to be a hard man to stop.